A rest day from running today. Instead I was enjoying the sunshine and playing rounders in Regents Park. 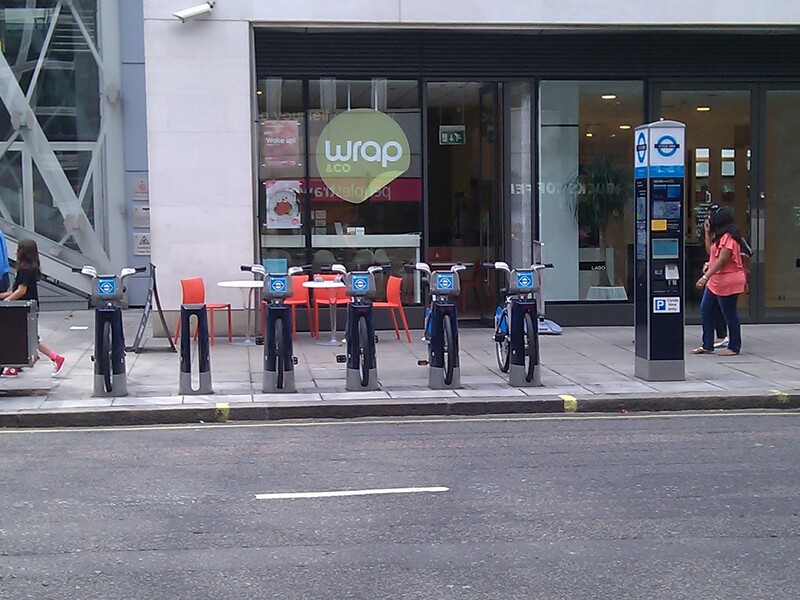 Someone turned up with a couple of bikes from the new bike hire scheme in central London. You may have seen these bikes at the docking stations dotted around the city. Once you have regsitered for an annual charge, you can take a bike for up to half an hour for free. 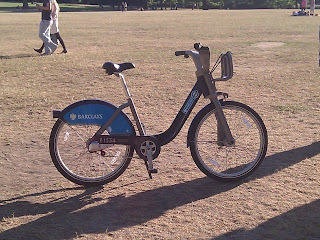 The main aim is to get people using the bikes for short journeys instead of taking the tube or bus. 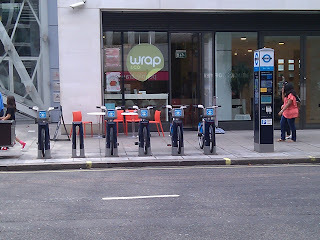 You pick up the bike from one docking station and drop it off at another. There are about 400 docking stations and if you are unlucky enough to find all the points are full when you try to return your bike, the terminal will provide information on nearby docking stations with free points. The first thing that struck me about the bike was how heavy and robust it was. These machines weren't made for climbing hills, but they are great for short, flat rides in central London. The chain is fully enclosed, protecting your clothes from oil, and there is space for a small amount of luggage. There are three gears, not many compared to your typical recreational bike, but fine for cycling on the flat. We were sitting at the edge of Regent's Park after the rounders and I noticed a lot of runners and joggers following the perimeter track. What struck me about them all was how they weren't smiling. Running is supposed to be fun! But they are looked serious or suffering or intensely focussed. Not one of them looked like they were enjoying their run!